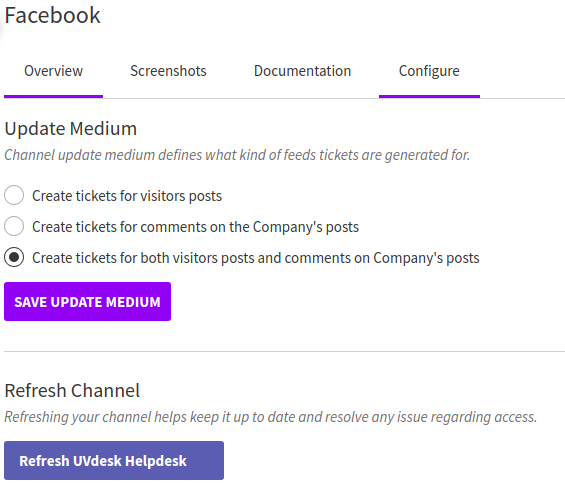 Facebook Help Desk Software allows companies to automatically generate tickets on UVDesk whenever any customer (Facebook user) creates a feed on one of the channels (Facebook Page) added by a company through the app. This provides companies with an added ability to interact with customers on Facebook directly through the existing help desk system. With Customer Feeds enabled, tickets are only generated for Facebook Feeds on Facebook Page wherein a customer (Facebook User) makes a post directly on the wall of the respective Facebook Page. 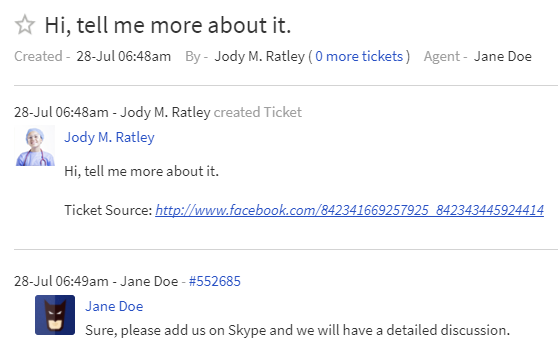 With Company Feeds enabled, tickets are only generated for Facebook Feeds on Facebook Page wherein a customer (Facebook User) makes a comment on one of the company posts (a post/status update by the respective Facebook Page). With All Feeds enabled, tickets are generated for both Customer Feeds and Company Feeds as described above respectively. A company can add more than one channels (Facebook Pages) to their helpdesk. These settings are unique to each and every channel, meaning that a company can configure different channels as deemed convenient. The application will automatically create a customer account for a customer whenever the respective customer (Facebook User) creates a Facebook Feed for the first time on either one of the channels (Facebook Pages) added to the company’s helpdesk. Account creation will depend on the configuration settings opted by the channel at the time of ticket creation, i.e., when the respective Facebook Feed is created. Once an account has been created, all further tickets generated by the respective customer will be associated with the created account. Customers can access their tickets by logging into their account through Facebook. What kind of tickets are generated upon Facebook Integration? 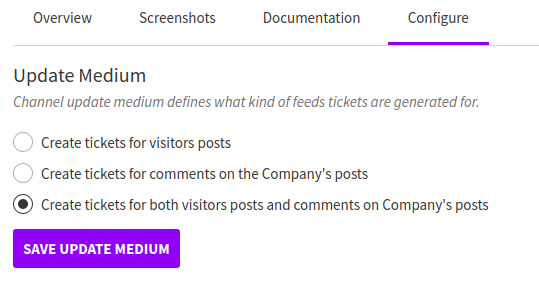 Basically, two kinds of tickets are generated, either it will be on visitor post on your Company’s Facebook page or on the Comments of the visitor on any one of your posts. 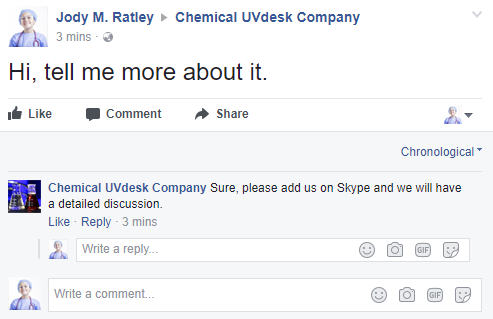 When you add Facebook channel with UVdesk, you will get the option to either choose any one option or both. Why are tickets not being generated in Facebook despite posts and comments? Over a duration of time, it’s possible that an error might occur during the ticket generation process for tickets which originates from Facebook. Due to this, your agents are not able to communicate with customers. To resolve this issue, you’ll need to “refresh” your channel by using Refresh Channel on the Configure Tab. How posts and comments are shown on UVdesk dashboard? Whatever the posts are done by your customers, you can directly reply on that posts as comments from your UVdesk Dashboard.